women and men whose rights are violated due to their ethnic, social, racial backgrounds and sexual preferences. 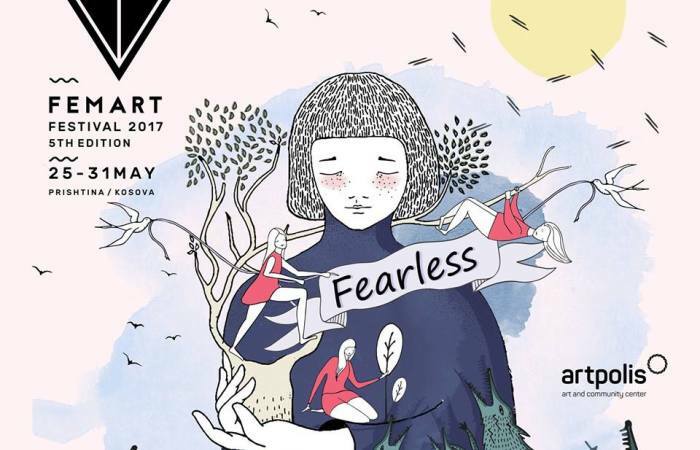 The festival is used as a platform for initiating and presenting ideas and creations that bring ahead the feminist concepts and its developments in Kosovo and advocate for equal women’s rights and peace-building in the region. The Festival brought together 100 local and regional women artists of all experience levels, from first-time exhibitors to experienced professionals. As every year 20 volunteers had the opportunity to be part of the festival, to help the festival in order for everything to go smoothly and in return FemArt helped them grow in cultural managerial skills, as well as in a personal level, new friendships and joyful moments. These volunteers come from different backgrounds and communities, Albanian and Serbian together into making social changes through art. At the end of the festival, they were certified for showing extraordinary willingness, commitment, tireless effort and valuable role as volunteers. The festival featured original Artistic creations created by women in Kosovo, region and worldwide. FemArt showcased 5 Theatre performances, 1 Dance Theatre, 15 Artistic films, 2 Documentary films, 1 Street Performance, 1 Meet the Poet, 1 Slam Poetry, 1 Stand-Up Comedy, 7 Music Concerts, 1 Yoga and Meditation session, 3 Exhibitions, 1 Art Installation 2 Presentations, 7 Panel Discussions, 1 Forum and 7 Workshops. On the 26th of November within FemArt we have organized a presentation of DOKU.TECH “Art as an inspiration for Technology” by Abetare Gojani and Leart Zogjani/Kosovo. In this presentation, Leart explained the way he sees art and technology as parts of the same continuum; he defines technology in philosophical terms and art as an inspiration for technology. Abetare and Leart also informed everybody about DOKU.TECH, especially this year’s edition, and its motto “Fear, Hope, and Everything in Between”. We as human beings stripped of knowledge, we fear the unknown until it becomes hope. The same goes for technology, we see it as something unfamiliar, something we fear until we shape our knowledge in that way, when we see it as useful and hopeful for our future.